2H Offshore was responsible for the detailed design and analysis of the nine single line hybrid risers for Heerema Marine Contractors (HMC) for BP’s Block 31 PSVM development, offshore West Africa. 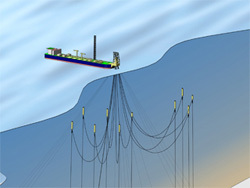 The freestanding hybrid risers were installed by HMC’s DCV Balder in 2030m water depth and connected to an externally bow mounted turret moored FPSO. The nine risers cover production, injection, gas lift and service duties. 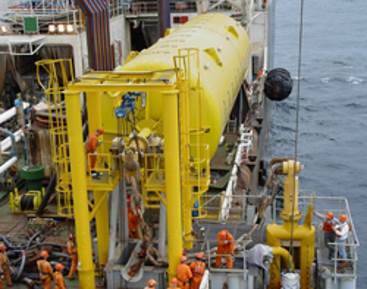 2H’s scope included the complete system design and configuration of the risers including global analysis, structural design of the buoyancy tanks, lower & upper riser assemblies, foundations and riser base spools. Detailed drawings, MTOs and specifications were produced by 2H and fabrication completed both in Europe and in Angola with engineering support being provided by 2H to HMC during this crucial stage. 2H has been working with BP, and later with HMC, on the Block 31 PSVM development since 2005 applying its experience both in deepwater riser analysis and structural detailed design.